You’ve heard about it. You’ve seen the pictures on Instagram. And now you’re here, curious and ready to conquer the second iteration of Desert X, the exhibition of site-specific art that two years ago stunned the art world and captured the imagination of more than 200,000 residents and visitors. The artworks in the exhibition — which stretches from Whitewater Preserve to the Salton Sea, with installations in almost every city in Greater Palm Springs — tend to relate to issues and conditions in the desert, including Native heritage, immigration, climate change, gun violence, depletion of natural resources, and even the hegemony of midcentury modern architecture. But they don’t preach; rather, they immerse you in a place and experience and allow you to draw your own conclusions. Artists do not apply to participate in Desert X. They come from around the world on the invitation of Neville Wakefield, the exhibition’s artistic director. They visit, they learn and observe, and they respond in the best way they know how: through art. While you can access most of the art at any time during the exhibition, which runs from through April 21, open on certain days and times and for events. Before you head out, we suggest stopping by one of the Desert X hubs to pick up a free program and map. Hubs are located in Palm Springs (Ace Hotel & Swim Club, room 119), Palm Desert (73660 El Paseo), and Indio (82713 Miles Ave.). Or visit Desert X for more information. While you’ll need two days to experience all 19 installations, here are 10 highlights that take you across Greater Palm Springs, beginning in the northwest. Los Angeles-based artist Sterling Ruby’s fluorescent orange monolith, SPECTER, appears as an apparition as if someone has deleted this geometric shape from the landscape in Photoshop. It’s located off Snowcreek Canyon Road in Whitewater. 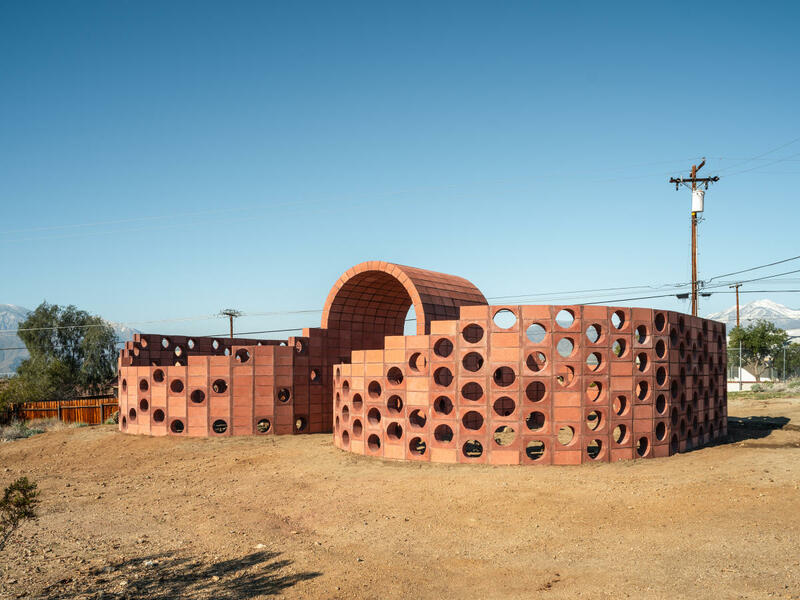 Julian Hoeber, another Los Angeles-based artist, has two installations in Desert Hot Springs. Going Nowhere Pavilion #01 is a Möbius strip made from concrete breeze blocks and relates to psychoanalyst Jacques Lacan’s attempts to use topology to describe the human mind: What is inside and outside the self can quickly become indiscernible. His second work, Executed Variant DHS #1 (Q1, CJ, DC), a painting sited in a swimming pool, is a loose variant on his “Execution Changes” series. The two works attempt to parse how forms can represent the logical, irrational, historical, and corporeal experiences of human consciousness. Also in Desert Hot Springs, Ghost Palm, by Katie Ryan of Santa Monica, is an almost-invisible sculpture depicting the indigenous Washingtonia filifera in steel, plastic, and glass sculpture — a manifestation of the artist’s fascination with the tenuous balance between fragility and sheer power. Near the windmills, on North Indian Canyon Drive, facing the wind farm and Mount San Jacinto, you can access one of Nancy Baker Cahill’s two augmented reality installations. Here, Revolutions addresses how we capture energy. Her other AR installation, Margin of Error, is located at the North Shore Yacht Club at the Salton Sea. Location: 33.88409, -116.546112 | North Indian Canyon Drive, facing the wind farm and Mount San Jacinto (southwest). Open the 4th Wall app on your smartphone and tap the Desert X button. You will be directed toward the drawing, which takes about two minutes to rise and unfurl. The only locally based artist featured in Desert X, Armando Lerma painted a mural, Visit Us in the Shape of Clouds, on a water tank in Coachella. It depicts a snake, a parrot, a fish, a monkey, a seashell, plants, and a figure appearing from a genie lamp to protect the water. Mary Kelly occupies three Palm Springs bus shelters with her entry, Peace is the Only Shelter. The work asserts slogans from the 1961 anti-nuclear Women Strike for Peace and uses the timetable of the bus schedule as a metaphor for the so-called Doomsday Clock. Cinthia Marcelle also inhabits multiple spaces — one each in Palm Springs, Cathedral City, Indian Wells, Indio, and Coachella as well as one across the border, in Tijuana. In each space, the Brazilian artist presents Wormhole, a shortcut through time and space, addressing the close proximity of Greater Palm Springs to Mexico, the fragility of the frontiers, as well as the boundaries. As you continue southeast on Highway 111, Pia Camil’s Lover’s Rainbow appears across from The Atrium in Rancho Mirage. An identical installation is located across the border, in Baja, Mexico. The Mexico City artist fashioned the rainbows from painted rebar, a metaphor for abandoned dreams as well as a gesture to re-insert hope into the land. Acknowledging that the desert was under water 6 million years ago and, with climate change, could be again, the Danish collective Superflex built a form at Homme-Adams Park in Palm Desert that is equally hospitable to human and marine life. Dive-In, a nod to another extinct species, the drive-in movie theater, will host screenings during Desert X (details available at desertx.org). 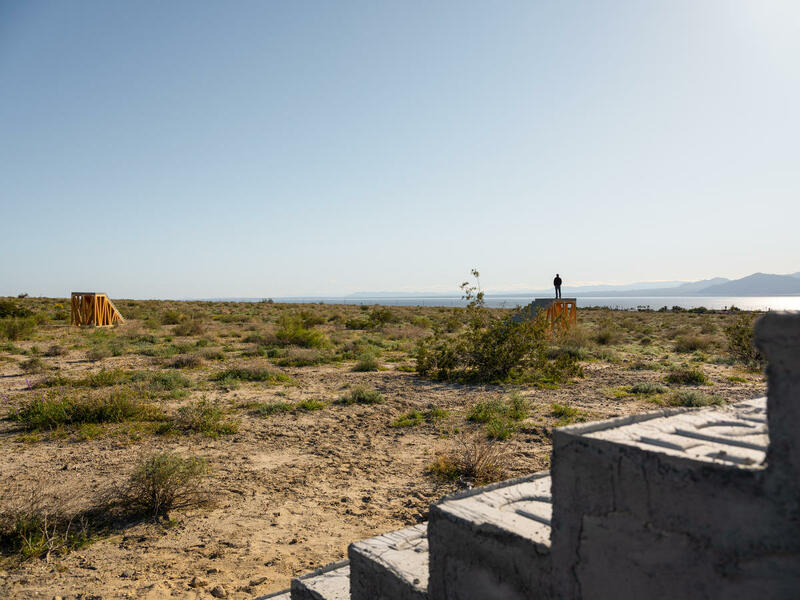 Iván Argote, a Colombian artist based in Paris, has installed A Point of View, an interactive sculpture at the Salton Sea. The brutalist form refers to the pyramids, its steps contain messages in English and Spanish, and its platform projects the viewer into the landscape. Additional art installations are located at Sunnylands Center & Gardens in Rancho Mirage (Iman Issa), on billboards along Gene Autry Trail (Cara Romero), in an iconic midcentury modern house in Palm Desert (Postcommodity), inside a former National Guard armory in Indio (Gary Simmons), and at the Salton Sea (Cecilia Bengolea and Steve Badgett and Chris Taylor). For locations, performance and lecture schedules, and other information visit desertx.org.